No other English-language book – excepting the Bible – has seen more reprints than The Compleat Angler. This book, in fact, has never been out-of-print since it was first published in 1653. 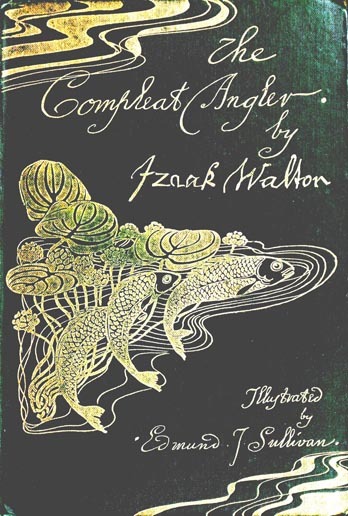 Ostensibly a treatise on the art of angling, The Compleat Angler is more akin to a self-help book on stress-free living as the subtitle suggests: A Contemplative Man’s Recreation. A keen observer of nature, Izaak Walton (c. 1594-1683) revelled in tramping – albeit lightly – through the English countryside. The benign plot develops from a chance meeting of Piscator (a fisherman), Venator (a hunter), and Auceps (a falconer) who exchange pleasantries about the merits of each man’s preferred sport. Venator, much impressed by the fisherman’s tale, decides to accompany Piscator who promptly becomes his mentor – not just of fishing but on matters of genteel living as well. The Compleat Angler was written during the Interregnum when England was gripped by discord between Puritans and Royalist and Oliver Cromwell ruled the land as Lord Protector. While not a political work, The Compleat Angler does extoll the virtues of a more austere – if not idyllic – lifestyle devoid of extravagance. As a literary work of art, The Compleat Angler is perhaps best summarised as an understatement. It may require more than one reading in order for its fullness to be appreciated. The reader’s effort is, however, amply rewarded.